Mix together in a spray bottle and try it out. 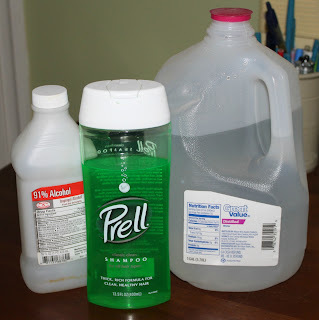 If it seems too sudsy, add less Prell the next time. This glass cleaner does a great job cleaning and smells a lot better than the vinegar. Let me know what you think of it. I use almost the same recipe but use Dawn dishwashing liquid (the original blue) instead of Prell. I love it on mirrors. But it is good to know I can use shampoo if I am out of Dawn. I would have never thought of that. When mixing I try to remember to add the Dawn last or I get too many suds. I usually remember....usually. TIP: For safety write on the bottle what is in it AND I write the recipe on the bottle so I don't have to look it up every time I make it. (You can write this on a piece of paper and 'laminate' it with packing tape.) I measure & pour the rubbing alcohol into the bottle then mark the level on the bottle. I then do the same with the water. Since I just squeeze and guess the amount of soap, I never have to clean measuring spoons or cups. Yes, I am THAT lazy. But pouring the soap in last should help with the bubbles when mixing. Love your blog!